References for Highly Qualified applicants will be contacted via mail, and background checks will be done. Interviewees will be contacted via phone. Also, check out Damaris Sarria's related post, which includes more details on the two interview periods. Also, based on past selections, we can expect the 2009 class to consist of about 12 male and 3 female with 9 military and 6 civilian. Although it's extremely difficult to be selected as a NASA astronaut, it's even harder in Canada and Europe, where there are also current astronaut selection processes underway. Canada's CSA had 5352 applicants for only 2 spots, while Europe's ESA had 8413 applicants from 17 countries for only 4 spots. Japan's JAXA also received 963 applicants this year for only 3 spots. (Thanks for the info, Curt and Takashi.). Added together, this means there were 18,263 applicants from the US, Canada, Europe, and Japan for only about 24 spots (0.1%). 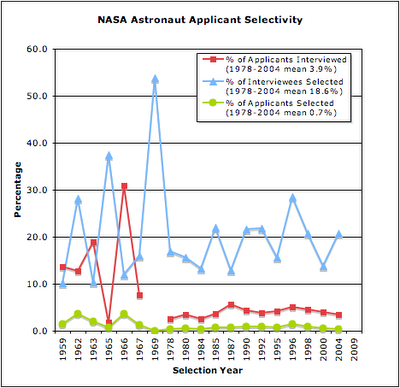 Thanks to an email from Curt on the Astronaut Hopefuls listserv, we learned that there were over 700 people disqualified due to medical, educational, or professional reasons. Thus, the pool of Qualified Applicants is approximately 2800. Again, an email on the Astronaut Hopefuls listserv sheds some light on the process. Instead of 400 Highly Qualified appplicants, NASA chose 450. NASA apparently broke the applicants up into groups based on discipline and had selection committees choose the Highly Qualified people within each disciplinary pool. We have learned that pilots are last in this sequence, so their reference and medical pre-screening letters have yet to go out. Reports are that the total number of applicants was 3564 rather than 3535. The current ESA selection process is for only 4 astronaut places! Brian, great blog. Say, I recently heard from Laurie in the Astronaut Selectio Office that they had around 4800 applicants. Just thought I would share since its a little more than the 3500. Of course she may have included the applicants who had ineligible packages. Great stats by the way. Thanks for the information, Dan. I'll see if I can verify the info and will update the blog as needed. At one time, I had heard there were 3800 applicants (rather than 3500), so I wonder if Laurie was off by 1000. By the way, I'll be posting another set of stats soon (whenever I can find the time). That post will deal with age, education level, military branch, number of career spaceflights, and a few more things. There is a great article in this month's Air and Space magazine on the astronaut selection process. 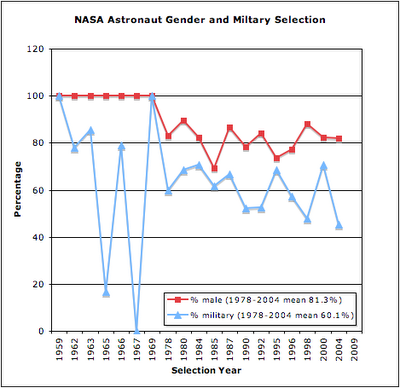 It says that according to astronaut selection manager Duane Ross there were 3535 applicants for the 2009 class. I changed the post accordingly. Yeah, you are probably right. It looks Laurie like was off by 1000. Thanks for the info. Also thanks for the Air and Space article. Very nice. I'll be on the look out for you new post with the stats. thanks. That's great, Rick. Good luck! I received (like most everyone on the boards) the "your application has been accepted, etc..." letter and email. Can you confirm, or have you heard that the supposed 700 or so got a "you were not qualified" letter or email? I know after this point, you won't hear anything till the end, but I'm wanting to know if we really have made some "cut" at this point at least to the 2800 or if the folks who were cut in the initial swag don't know they've been cut. Hope that makes sense! Also, have you heard how far along NASA is in notifying references? Rick jokes about being 399/400, but historically there are several folks on the astronaut hopefuls board who have references contacted and quite a few who get interviewed. I'm just as much in the dark on that question as you are. Hopefully, someone on the board or a reader of this blog will reply to your question. My reading of Curt's email earlier today was that the ~735 people were or will be notified of their disqualification, but the other 2800 will just have to play the waiting game until the very end. I do know from a conversation with Teresa Gomez that all applicants will be notified if they didn't make the cut after the whole process is complete sometime around April-May 2009. Yeah, you do find out in the end. I competed in 2004 before I had my masters...knew I wouldn't make it, but good to get your name up there. I got a nice letter at the end of the process. Hopefully we'll find out where the process stands soon w/ reference notification. Did anyone's references actually get contacted last week. Or was it folks who said "contact me first, before contacting my supervisor" get called by Teresa G and responding because they know they are on the list of folks whose references are to be contacted. Do you know if any of the references actually got contacted. Did they receive the form letter. I think you're right that references haven't actually been checked yet. Instead, some applicants were contacted if they indicated that was their preference before having references checked. My references got contacted thru mail this past Monday. Hey I just heard through the Astronaut Selection Office that they have contacted about 50 applicant's references and will be getting a hold of the rest (400) over the course of this month and November. Interviews will start Nov 17. They said they are overlapping reference requests and interviewee selection. Congrats to you who get your references checked and good luck to everyone else. Has anyone who said "contact me first, before contacting my supervisor" been contacted? Anyone scheduled for an interview? This whole process has been pretty exciting! Yes to the reference question. If you read through some of the comments here and on the Astronaut Hopefuls message board, you'll find that at least one person has reported being asked if NASA may contact his references. Another person has reported that the first 50 applicants' references have been contacted so far, and they expect the first interviews to begin Nov 17. Brian, thank you for keeping us all up to date with your blog. My references were contacted today and I was asked to take a preliminary physical in my area. No interview yet but this appears to be a first step. I just stumbled upon this blog and wish I'd connected with you all earlier. Does anyone know if a reference check actually equates to an interview? No, a reference check does not guarantee you for an interview. About 400 will have their references checked, but only about 120 will get interviews. This probably means they primarily use the references (and also the pre-screening medical exams) to narrow the field to get the interviewees. Thanks Brian. Do you know if everyone goes through a pre-screening medical before an interview? Anymore news on your interview? No news yet, but no news isn't necessarily bad news... at least that's what I'm hoping! If, as of today, your references have not been contacted then you will not be called for an interview. I received a call from Teresa, what the poster on 07-Dec said is correct. If you have not been contacted as of yet by mail stating that you are in the HQ list, you are done. All slots are filled. Hard to say,but, sadly, true. I unfortunately found out several months back that I didn't even make the highly qualified, even with having several people who were in the know looking at my extensive background in medicine, science, prior service Army helicopter pilot (qualified in three airframes), and the list goes on. It was stated I definitely should make it at least to the HQ. It was a bitter pill to swallow when I found out from the Selection Office my application burned up on re-entry and never even got to the HQ. I still can not figure it out. I have come to the conclusion, I probably have a better shot at getting into space if the U.S. and world economies collapse and we turn to space in hopes aliens show-up on our door steps to give us some guidance on next steps on how to get our act together. Then, maybe, I might have a shot. There is always hope. Those of you who have gotten notice you have not progressed, or simply left in the dark, are not alone. We all share in each others pain. I empathize with each of you. What's that ole saying? Misery likes company;-) So, I figure I'd make my first post. I have had time to mourn sufficiently. I just went looking for news on this to see if perhaps the class had been announced and found this blog. It was a difficult decision for me to apply. 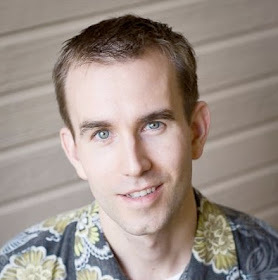 I have worked on the program for years as an engineer with a master's degree. I don't have illusions about the hazard. But it wound up being something I just had to do. I spoke with people I had worked with and for to ask if they would be willing to be references. I was surprised and heartened by how supportive they were. I got all the paperwork in and Teresa Gomez was very nice about checking to make sure all was in order. And then came a long wait. I didn't advertise among my friends I was doing this. At the end of the day, I didn't want it to be a major topic of discussion. And in December, I began to feel nervous about having heard nothing, so I sent in an email and learned my references should have been pinged if it was going to happen. It was a strangely alone and empty feeling combined with a dose of self doubt as to why I had the nerve to try and the expectation of at least getting to an interview. But my family reminded me of how full my life already is, and that really made a big difference. After all, they were the first ones to support my bid. And I really had to try. It would be easier to try again, I expect. I would, however, like some feedback on what they are looking for and where my application fit and where it fell short. But it does help finding this blog. Thank you for setting it up. Thanks for sharing your story. You're not alone. To get specific feedback on your application, you might want to contact the Astronaut Selection Office in a few months after the current selection process is past. I've heard that they're usually willing to share personal feedback. You might also want to post questions on the AsHos message board, as there are many folks there who have applied multiple times. Good luck! I missed the boat but am a Ph.D. with military flight experience and will want to apply for the next candidate group. Any idea when the next selection process will be? No one knows for sure when the next selection will be. A good guess is 4-5 years from now. Thats deep, thanks, many are with you, good luck.